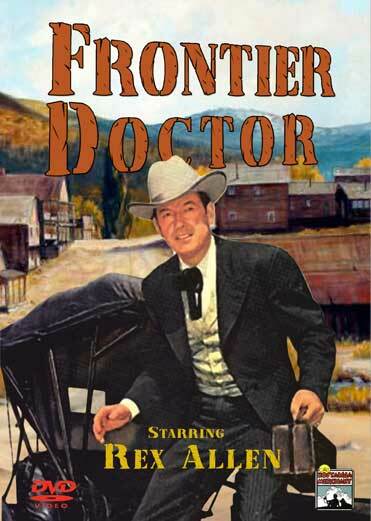 Frontier Doctor starred singing cowboy Rex Allen. This series ran for one season from 1956-1957. It was an attempt to mix the medical show and western genres; and to capitalize on the popularity of legendary “B” Western movie star Rex Allen, known as “The Arizona Cowboy”. The stories are about the adventures of Bill Baxter, straight shooting doctor in the Arizona Territory in the 1880’s. Disc 1 – The Homesteaders, Outlaw Legion, Twisted Road; Disc 2 – Queen of the Cimarron, San Francisco Story, Drifting Sands; Disc 3 – Mystery of the Black Stallion, Fury of the Big Top, Gringo Pete; Disc 4 – Trouble in Paradise Valley, Crooked Circle, Danger Valley, Flaming Gold. 4 – DVD Set – Digitally remastered.